Joel Goldstein and his son Bart will be speaking on April 10th at City Fish Market in Boca Raton, from 11:30 until 1pm. They will be talking about their family’s experience with traumatic brain injury. Lunch is included with the price of tickets. Tickets are available here. Joel Goldstein is a writer, speaker and advocate whose mission is to improve the lives of survivors of Acquired Brain Injury and their families. His critically acclaimed book, “No Stone Unturned: A Father’s Memoir of His Son’s Encounter with Traumatic Brain Injury,” can be found in libraries worldwide. Its theme is that better outcomes to brain injuries may be possible through use of safe alternative therapies. Joel has written about ABI for Brainline.org., Exceptional Parent Magazine, Adoption Today, Caregiver Space, and Rehab & Community Care Medicine. He has spoken on NPR, public television and to audiences ranging from state BIAs to Medical Societies and the New York State Assembly. Joel resides in Upstate NY with his bride of 44 years, Reiki Master Dayle Groudine. Together they have left no stone unturned searching for remedies, both conventional and alternative, to Bart’s grave injuries. 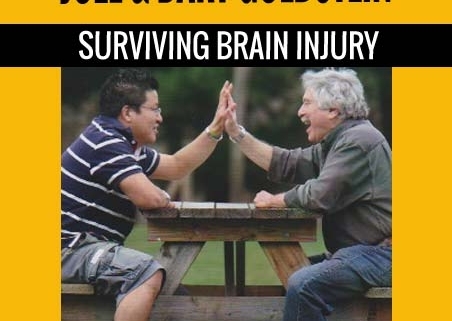 Along with several distinguished physicians, the Goldsteins formed a foundation to explore and promote the use of safe alternative therapies for brain injuries, The BART Foundation, a 501(c)(3) public charity. www.thebartfoundation.org. Joel is joined by his son Bart Goldstein, the subject and hero of No Stone Unturned. Bart has been the focus of articles and stories about TBI and the unconventional approaches that drove his recovery. He was featured on NBC Nightly News with Brian Williams in a segment exploring alternative therapies. Bart is a Korean adoptee, who has been active in Camp Mujigae and other adoption groups. He is a board member of the BART Foundation, and lives and works in Delmar, New York. As a brain injury survivor-advocate he has spoken on radio, to brain injury groups, and the New York State Assembly.